In Janda et al., Acta Physica Slovaca 55 (2005) 507-514, we present a free software for modeling the electron dynamics in the uniform electric field named Web-EEDF. It provides electron energy distribution function (EEDF), electron drift velocity, electron mobility, and collision frequency of electrons with neutrals as functions of reduced electric flied strength (E/N). EEDF (Fig. 1) enables us to calculate electron mean energy, electron mean free path, rate coefficients (Fig. 2) of electron-molecule collisional processes (e.g. excitation, attachment, ionization), and the branching of the electron energy towards these processes. Calculated rate coefficients of electron-induced processes can facilitate better understanding of the importance of various reaction pathways leading to the decomposition of air pollutants in various gas mixtures. Despite its simplicity the Web-EEDF results are in good agreement with literature. It is also suitable for educational purposes by providing clearer insight in understanding physical and chemical mechanisms in plasma processes. This electron dynamics modeling was further developed in Janda et al., Eur. J. Phys. D 45 (2007) 309-315. Motivated by the decomposition of CO2 and the synthesis of amino acids in DC electrical discharges, we investigated the electron dynamics by Monte Carlo simulations in N2/CO2 gas mixtures. 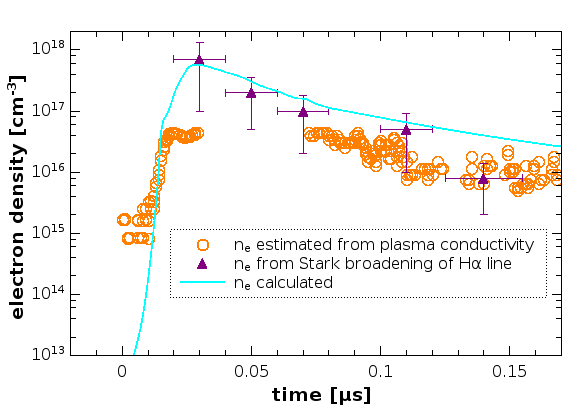 The results of the simulations include electron mean energy, drift velocity, collision frequency of electrons with neutrals, mean free path of electrons, rate coefficients of selected electron-impact processes, and ionization and attachment coefficients as functions of the reduced electric field strength and the composition of a gas mixture. The knowledge of these parameters is crucial for the understanding of plasma induced chemistry and behavior of electrical discharges in such mixtures. The applied computational method was proved useful for the calculation of steady-state EEDFs and derived parameters characterizing electrons in homogeneous electric fields in various gaseous mixtures. Web-EEDF source code can be downloaded from http://enviro.fmph.uniba.sk/web-eedf. We are currently developing new version which will enable to simulate time evolution of EEDFs, or the relaxation of electrons in electron beams. Fig. 1. Electron energy distribution functions(EEDF) in air as functions of reduced electric field strength (E/N). Fig. 2. 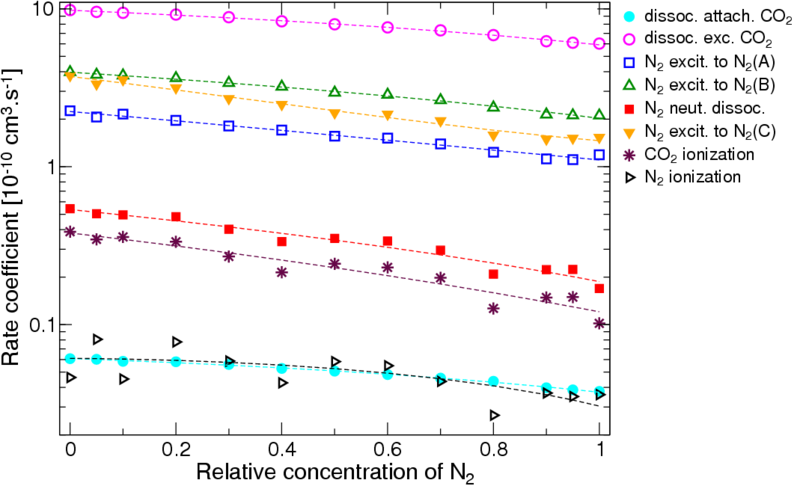 Rate coefficients of the most important electron impact reactions in N2/CO2 mixtures, E/N = 120 Td. The modeling of chemical kinetics aiming to calculate the density evolution of all species included in the kinetic model is an effective tool for complex systems description. In many cases, it is the most powerful way to solve problems where the complexity inhibits using analytical methods and direct experimental measurements. It is commonly used not only for modeling of cold plasma chemistry, but also for description of high temperature steady state arc plasma, nanosecond duration of streamer propagation, and other problems in plasma physics and chemistry. 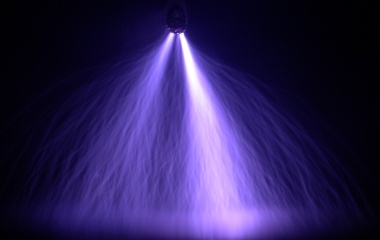 We are currently developing chemical kinetic model fitted for the transient spark (TS) discharge. This model can be used to determine the evolution of density of various species. Moreover, this model is able to describe macroscopic parameters such as plasma conductivity and current density in the plasma channel. The validity of the model was tested by comparing calculated electron densities with experimental data (Fig. 3). This model is based on available open source package ZDPlaskin. We studied the mechanism of the streamer-to-spark transition and breakdown in the TS using this model. We assume that the breakdown mechanism in TS is based on the gas density (N) decrease and can be summarized as follows: heating of the channel → increase of the pressure → hydrodynamic expansion → decrease of N in the core of the channel → increase of E/N → acceleration of ionization processes. However, this mechanism is influenced by species accumulated due to previous TS pulses at higher TS repetition frequencies. Sensitivity analysis focused on major electron loss and production processes indicates an important role of the amount of O2 dissociated by the previous pulses. Lower density of O2 means lower rate of electron attachment, while accumulated atomic oxygen atoms lead to acceleration of electron detachment processes. Further research of this memory effect using improved version of our kinetic model simulating sequence of pulses is needed to verify this hypothesis. We further plan to use an improved version of our model to study generation of various reactive species by TS discharge. Fig. 3. 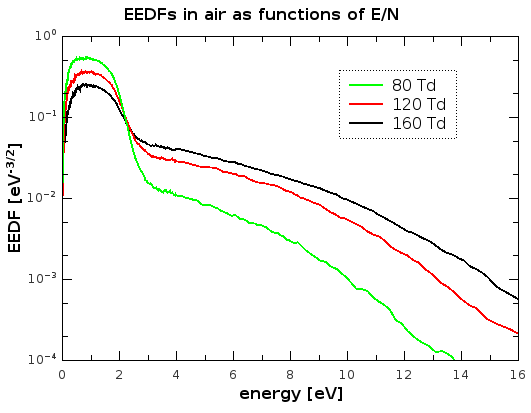 Comparison of measured and calculated electron densities during the spark phase of the transient spark discharge, repetition frequency around 1 kHz.